Se avete mai seguito The Hills, saprete sicuramente di chi sto parlando. Infatti, Lauren Conrad non è solo una ragazza alla moda, ma sopratutto un personaggio televisivo, attrice e stilista statunitense. Ora che ve l'ho presentata, vediamo due dei suoi look che potremmo "imitare" con un low budget! Il primo look l'ho scelto per il "sempreverde" accostamento black&white, al quale viene dato un tocco di colore, grazie ad una pochette verde salvia (uno dei tanti colori colori pastello, che andranno molto di moda per la stagione estiva). If you have watched The Hills, surely you know who I'm talking about. In fact, Lauren Conrad is not only a fashionable girl,but especially a TV personality, actress and fashion designer from U.S. Now that I've presented her, we see two of her look that we could"imitate" with a low budget! I choose the first look for the "evergreen" black & white combination, which is given a touch of color, thanks to a clutch of sage green (one of the many pastel colors, which will be very fashionable for the summer season). Il secondo look, invece, l'ho scelto per un'altro accostamento che mi piace, quello del blu elettrico con il nero, e per l'intramontabile giacca di pelle! Quale preferite dei due look? I have chosen the second look, however, for another approach that I like, that of the electric blue with black, and the timeless leather jacket! I have that leather jacket it's so cute! I love the first look. Kisses. è adorabile, riesce sempre ad essere chic! She has such beautiful, simple, and elegant style. Love this post! That's a great copy of her look. outfit che non mi entusiasma , lo trovo piuttosto banale ...sono tutte uguali ! Mi piacciono abbastanza tutti e due! Great style. I buy same leggins for 10 Euros in NewYorkers. The first look is really amazing... love it! Lei è davvero molto bella...adoro questi 2 outfit! Personalmente preferisco il primo look! E' una ragazza molto bella è fortunata perchè le sta bene tutto! Belli tutti e due i look ma preferisco il primo per la semplicità e l'elegnaza!! Post molto interessante ed utile, grazie! mi piace moltissimo questo look, in particolare amo il dettaglio della clutch verde! Thanks for your cute comment and follow, I'm a new follower, too! Both the looks are great!But I'd prefer the first one.It has got everything I love-layering(specially using blazer),white and pastel colored clutch! I prefer the second too, but both are great. You have an amazing blog. I'm thinking to be your follower. Love a tuxedo jacket be it white or black! 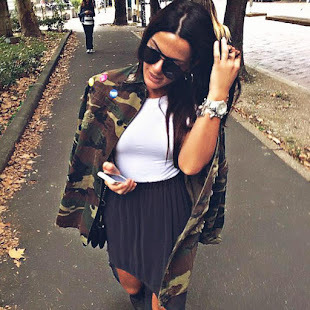 Lovely post, I also love Lauren´s style! Love her! She's my style icon! I love her style, she can make herself look so great - effortlessly! I admire that, and I'm glad I found her Style -book on sale last autumn ;) It's so great. Adoro la gonna blu elettrica! Love this look. Simple, clean and very stylish. Thank you for stopping by from our blog and your lovely comment. Glad to discover ur blog too. I'm looking forward to reading your future posts! Thanks for the sweet comment! I adore Lauren Conrad's style and this look is lovely! Great finds to get those chic looks, great work! Fantastico il tuo blog! Io ne ho appena aperto uno ma praticamente sono all'inizissimo! Se vuoi passare e darmi qualche consiglio per migliore mi faresti a very great gift!